The book starts with the starters but as everyone is so different, some like soup, others like pate, I’ve decided to skip them and head straight for the main event; turkey. There’s quite a few to choose from and while I can’t comment on the price as they’re all “price in store”, knowing Aldi they’ll be affordable. Gareth picked out the Fresh British Stuffed Turkey Crown which will serve 6 people. With a bacon lattice on the top to lock in that moisture and a pork, cranberry and apple stuffing, you can cook this in the bag for maximum flavour. He also liked the sound of the Fresh British Beef Rib Joint with Salt and Pepper Seasoning because it’s Gareth and he likes a beef rib! This is £13.99 per kg and is on sale from the 21st December. I also can’t move on from the meat section without mentioning the Christmas Pudding Gammon. My mum always used to have a gammon joint on Christmas Day, as well as the turkey, so it’s very Christmassy to me and the fact that it’s got a fruity stuffing and a mince pie glaze…well, what more could you want? On sale from the 19th December, it’s £12.99 per kg. Next, we have the sides and there’s no way I can’t mention the Giant Pigs in Blankets. You’ll get 2 foot long sausages wrapped in streaky bacon for just £2.99 and they’re on sale from the 6th December. Gareth has already told me that we’ll be heading to our local Aldi to pick some up that morning! Now I know that there’s a few people out there who hate sprouts (Gareth is one of them) but Aldi have this delicious sounding gratin. With chestnuts, cranberries and mascarpone, it’s sure to make you love sprouts. It’s only £1.99 and will be available from the 19th December. And I can’t tell you how nice it is to see ready-made Vegetarian Stuffing. You can get two flavours of it; Ruby Port & Spiced Apple or Sage & Onion. They’re £2.49 each and will be in store from the 13th December. Speaking of vegetarians, I”m so impressed with Aldi this year. Nowhere else has made me want to order from them but Aldi is where I will be buying my vegetarian main from and I’ll be getting these Wellington Slices. In two flavours; Cauliflower, Leek and Goat’s Cheese or Butternut Squash and Brie. They’re only £2.99 each for two so they’re perfect if you have veggie guests coming. You can get your hands on them now. The other strong contender were these Vegetable Parcels. Also in two flavours; Spinach, Leek and West Country Cheddar or Mushroom, Stilton and Cranberry, they’re on sale now and cost £1.99 for two. When it comes to dessert, you want something which is going to be impressive. The Panna Cotta Wreath is just that. The bright white of the creamy panna cotta looks amazing against the pink Heritage raspberry compote in the middle. This will go on sale on the 21st December and is £5.99. I liked all of the desserts on offer from Aldi but if I had to pick one more, it would be this Buche De Noel. Passionfruit flavoured, this is a twist on a traditional and looks amazing, the mirror glaze on top just finishes the whole thing off. You can also get this on the 21st December and it’s £5.99 too. You can’t buy a cheeseboard from Aldi but that doesn’t mean that you’ll miss out. Instead, they’re doing various truckles from just £1.89. With flavours such as Red Leicester with Habanero Chilli, Wensleydale, Cranberry and Sloe Gin and 1000 Day Aged Gouda, they’ll be something to fit everyone’s tastes. 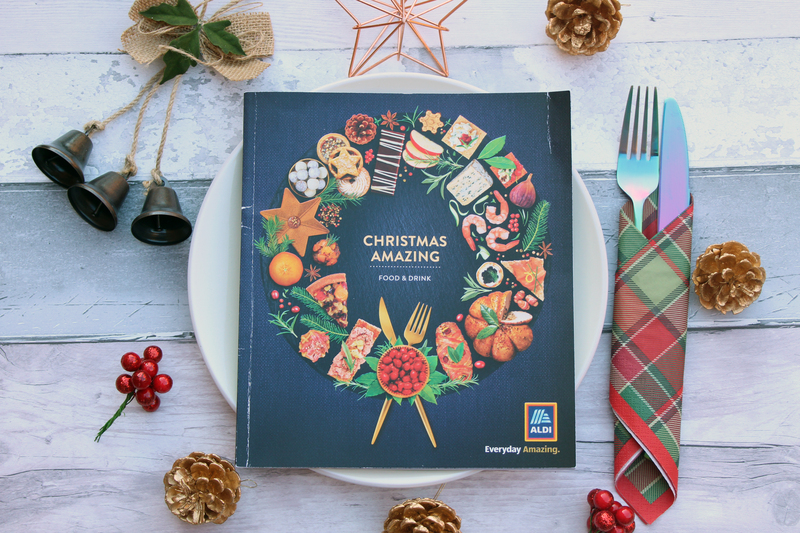 Some are available from the 30th November, others the 12th December so it’s worth going along to your local Aldi and checking it out. Lastly, the party food! We’re suckers for some gyoza (thanks Wagamama!) so when I spotted that Aldi are doing their own, I was so happy. Choose from Prawn or Vegetable for just £2.99 and you’ll have something to please every guest. They’ll be available from the 12th December. Next is the Oriental Vegetable Snack Selection which features 12 different bites, including Sweet Chinese Style Barbecue Crackers. They’re only £1.99 and you can get those now. Finally, they have these Cheeseburger/Chorizo Sliders. You’ll get 10 in a pack and at just £3.29 each, you could both packs and try them all. They’re also available from the 12th December. Go into store, choose what you want and buy it. It’s that simple. No ordering online, ndepositit and no collection day. Why complicate things?! It’s a wrap! That’s the last of my 2018 Festive Food Guide and I don’t know about you but I am now ready for all of the Christmas food; cheese, desserts, roast potatoes and even sprouts. I hope my guides helped you but if you missed any, head back to the beginning with Tesco and start from there.